The Moody Scholarship Selection Committee is comprised of six individuals with extensive backgrounds in Admissions, Financial Aid, Academic Administration and Business. This group meets three times each year to evaluate, select, and renew the pool of applicants. Please refer to each of their backgrounds below. Mr. Bormann retired as Director of Student Financial Aid at Texas A&M University after 36 years of service. He holds degrees from Blinn College and Texas A&M University. He now holds the title of Director Emeritus of Student Financial Aid conferred by the Board of Regents, The Texas A&M University System. He also continues to hold the position of head usher for the Texas Aggie football program since 1972. Before joining Texas A&M, he spent some time in the commercial banking industry in Brenham and College Station. He has held leadership positions on local, state, and national levels. Some of those groups include: The Moody Foundation Scholarship Committee, the Franklin Lindsay Student Aid Foundation, The Terry Foundation, and The American Heart Association. Also, long standing membership with The Association of Former Students and The 12th Man Foundation of Texas A&M. 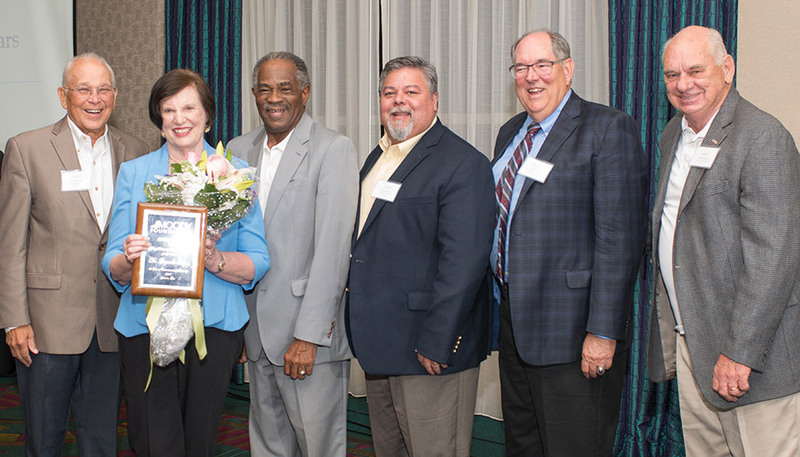 Dr. Hayes retired as Vice President for Administration after 50 years of service at Galveston College. She is a National Certified Counselor and has held leadership positions at local, state, and national levels. She has also served on local directorate boards for The Rotary Club of Galveston; The Mental Health Association; The Children’s Center; The American Cancer Society; the City of Galveston’s Family, Children, and Youth Board; Omicron Chapter of Delta Kappa Gamma; and the United Way of Galveston. Prior to joining Galveston College as a Counselor, Gaynelle taught English and history at Ball High School in Galveston. Ray retired after 35 years with the University of Texas Medical Branch- Galveston. The last 25 years were as Associate Dean in The School of Health Profession. He earned his bachelor’s degree from Huston-Tillotson College in Austin, TX and completed his graduate work at the University of Houston. While there, he earned a master’s degree in Clinical and Administrative Social Work. He also completed the Management/Administrator Development Program at Harvard University. He currently provides consultation in organizational effectiveness and staff development. He remains active on several city of Galveston appointed boards and is an elected member of the Board of Regents at Galveston College. Fred has over 25 years of experience in higher education administration and is currently the Registrar at Trinity University in San Antonio. Before moving back to his hometown in 2000 to join the staff at Trinity, he held administrative positions in enrollment services at Baylor College of Medicine, Texas Tech University Health Sciences Center, and the University of Houston. He earned his Bachelor’s degree from the University of Texas at Austin, and a Masters in Education Administration from the University of Houston. Over the course of his career, Fred has been actively involved with various higher education professional organizations on the state, regional, and national level. He has conducted numerous presentations and workshops, and has served in leadership positions including President of the Texas Association of Collegiate Registrars and Admissions Officers, Board of Directors for the Information Associates of Texas, and Executive Committee Chairman of the Franklin Lindsay Student Aid Fund. He currently resides on the edge of the Texas Hill Country, just outside of San Antonio, with his wife Laurie, daughter Jessica, and son Daniel. John has over 40 years of experience in higher education administration and is currently University Registrar and Executive Director of Enrollment Services at Southern Methodist University in Dallas. He earned his bachelor’s degree from Southern Methodist University. He also earned a Master of Liberal Arts and Master of Business Administration. Outside his registrar duties, John has served in numerous capacities at the university including serving as president of the SMU Staff Association, serving on numerous search committees and serving on the university’s Judicial Council for nearly two decades, first as a board member and then as Chair of the Council, a position he held for nearly a decade. John is a recipient of the “M” Award, the most highly prized recognition bestowed upon students, faculty, staff and administrators on the SMU Campus. Outside of SMU, John participates actively in regional and national higher education organizations. He has served as president of the Texas Association of Registrars and Admissions Officers, the Southern Association of Registrars and Admissions Officers, and the North Texas Council of Registrars and Admissions Officers. He also has served on numerous committees and task forces of the American Association of Collegiate Registrars and Admissions Officers. John resides in Dallas with his wife Cheryl, a business news columnist for The Dallas Morning News. His daughter Katelyn is a bilingual teaching coach for Teach for America. Jim is the Past President of the Bay Area Houston Economic Partnership and a strong advocate of education. He came to Houston in 1966 to support the Apollo program through the Grumman manufacturing facility. When Department of Defense priorities shifted, Jim remained in the area and in 1993 was elected to head the Bay Area Houston Economic Partnership. At the helm of this organization, he helped to diversify the economic profile of the area to become less dependent on the Aerospace industry. He serves on many boards and organizations in the area.